Group ‘seminar’ with visiting 73101, April 2008. New volunteers are always welcome in the Llangollen Diesel Group. Although previous experience of working with diesel locomotives or large mechanical and electrical machinery is always expertise we are glad of, this is certainly not a necessity. Our Group consists of volunteers of all ages, skills and backgrounds. 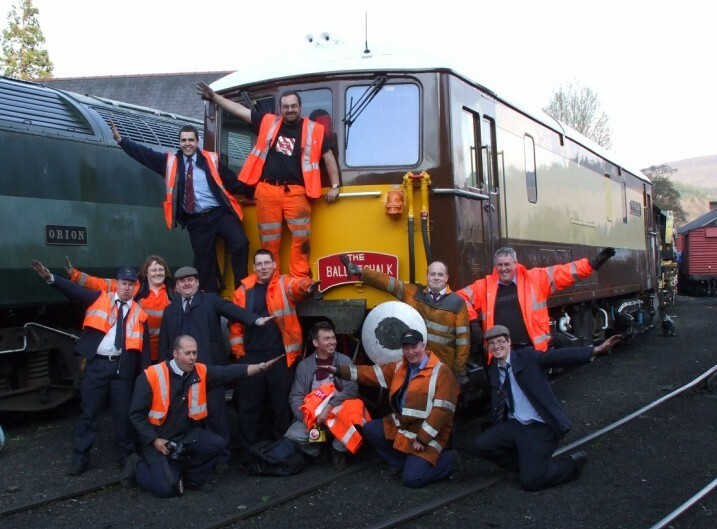 Comprehensive training and support is available from experienced members of both the Group and Llangollen Railway. All you need to bring to the party is your time, enthusiasm and preferably some overalls! In the photo below, we see our Secretary and Chairman preparing to lift the turbo from former fleet member Class 25 No 25313 which left the Railway in 2009. Everyone in the Group mucks in! However, we pride ourselves on rewarding hard work by making our locos accessible to those who wish to give their spare time to get their hands dirty and help keep them running. We also have an established traction trainee programme to allow those who wish to become involved in operations the chance to do so. Be it one day a year or every weekend, your support will be greatly valued. Your skills may not even need you to be in North Wales to make a difference. Simply publicising the LDG at other railways is a great help! Please drop us a line using the “Contact Us” facility accessible above. Join the Llangollen Railway Trust. This is essential to ensure you are covered by insurance when working on the railway. You will need to be 18 or over. Younger volunteers are encouraged to get involved, but will need to be under the care and supervision of a parent or guardian. Everyone mucks in at the LDG! Below we see our Chairman Mark and Secretary Col getting stuck in with cooler group repairs on D1566.